With all the flak that that the United Progressive Alliance (UPA) got for its “policy paralysis” and anti-growth policies (apparently both can simultaneously occur), one would hardly have expected a sharp economic revival in its final year in office. 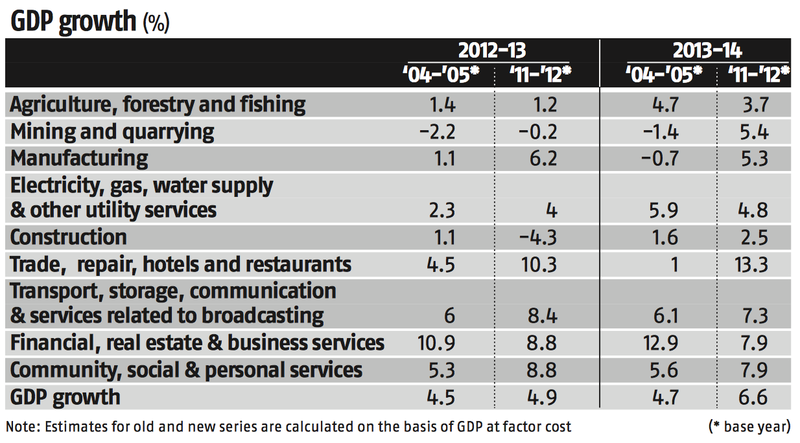 However, new and improved government economic data shows that in 2013-14 (i.e. the fiscal year ending March 2014), annual growth was a respectable 6.6%, up 1.7 percentage points from the previous year. This recovery is comparable in scale with the 1.9 percentage point growth spurt (to 8.6%) we saw in 2009-10 following the 2008 crash. The chart shows that the biggest upward revisions (compared with the old data series that uses 2004-05 as base year) are in the areas of manufacturing and “trade, repair, hotels and restaurants”. For 2013-14, there is also a big upward revision in “mining and quarrying”. This is important: it tells us that despite what we have heard from lobbyists, industry associations and commentators, manufacturing performed reasonably well under the UPA. The mining industry, whose woes are only partly ascribable to UPA policy (other actors being the judiciary and state governments), also began a substantial recovery in 2013-14. The share of manufacturing in the economy (under the gross value-added calculation) has also been revised from 13-15% under the old series (over the past three years) to 17-18% under the new series. This renders the government’s “Make in India” target of generating 25% of gross domestic product (GDP) from manufacturing by 2022 more achievable. Are these revisions meaningful? R Jagannathan misses the point in attributing the growth jump mostly to the base effect created by a 2.2% reduction in the estimated size of the economy in 2011-12 (see table below). That did occur, but the 2012-13 estimate was also lowered by 1.3% while the 2013-14 estimate remained flat, none of which makes the growth numbers any less real. In fact, the new data are much more robust, particularly when it comes to the corporate sector. For instance, the old series relied on Reserve Bank of India data pertaining to about 2,500 companies, while the new one uses the MCA21 database at the Ministry of Corporate Affairs that covers 5 lakh firms. The obvious takeaway is that manufacturing continued to grow at a respectable pace despite the cramping effect of inflation, high interest rates and impaired balance sheets. So do these numbers really vindicate the UPA (as ex-Finance Minister P Chidambaram has stated)? There can be little question that the UPA went into policy paralysis between 2010, when serious allegations of corruption broke, and 2012 when it finally summoned up the will to raise fuel prices and permit FDI in retail. Most people would agree that it did some good things (such as institute a credible monetary policy under Reserve Bank Governor Raghuram Rajan, approve long-pending industrial projects and reduce fuel subsidies) but that its governance capacities were sapped by revelations of large-scale crony capitalism. But as anger towards the UPA fades over time and its record is examined more dispassionately, the view that it seriously damaged India’s long-term growth prospects will ease into a more balanced critique. Morgan Stanley Research today issued a report that says that the new data showing a growth acceleration in 2013-14 are inconsistent with other indicators, such as the revenue growth of 0.9% clocked by 3,736 firms in the manufacturing and services sectors. This number, they say, has previously moved in sync with economic growth.